Two events on the same weekend draw crowds for Portland springtime automotive tradition. Typical Pacific Northwest spring weather did not completely dampen the spirits at the two vast Portland automotive swap meets last weekend. Both events have been held on the same weekend for many years at Portland International Raceway and the nearby Portland Expo Center. They routinely draw hundreds of sellers and thousands of buyers, many of whom traveled between the two locations on shuttle buses looking for needed parts, potential projects and hoped-for bargains. This year was no exception. Heavy rain fell throughout much of the weekend, broken by occasional clearings and rare sunny skies. 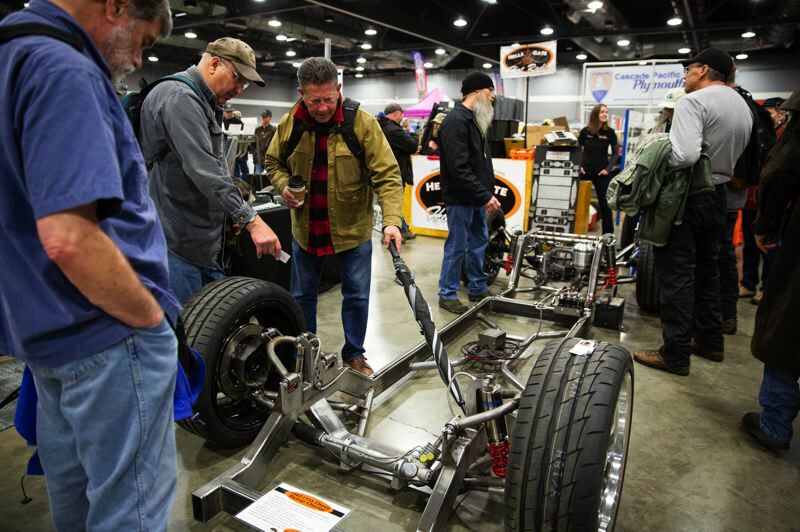 Despite the shifting conditions, over 15,000 officially made it to just the Expo Center, drawn by everything from tiny rubber grommets to customized cars and trucks at both meets. Most of the gear at both events was related to the so-called Golden Era of American auto manufacturing, between the 1940s and early 1960s. The crowds might seem surprising to those who believe the Portland area is dominated by mass transit advocates, walkers and bicyclists who believe motor vehicles should be a thing of the past. But it is a sign of a thriving local car culture that bursts out in warmer months with weekly outdoor car shows throughout the metro region. Many anchor community fundraising events that benefit charities. 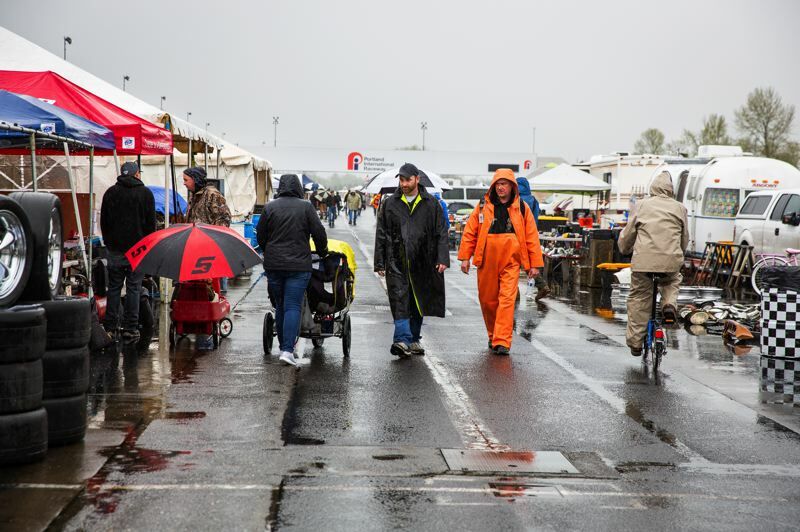 Before the rains came, veteran sellers knew to erect tents and tarps along the racetrack and in the center's parking lot, and experienced customers wore layers of rain gear to ward off the worst of the weather. "Sometimes I wish they were later in the season, but I know the track is in use when the weather's better," said Jesse Lamond of Monmouth, who first begin coming to the PIR Auto Swap Meet to sell car parts with his father more than 10 years. This year he camped out behind his tables in a 1987 Argus travel trailer, which he acquired from his father and is restoring. 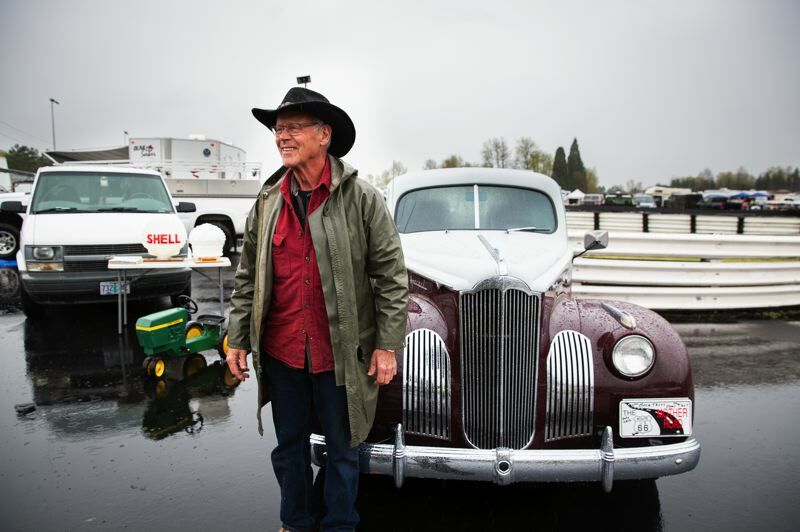 Rod Olsen was selling only one thing at PIR, a 1941 Packard 110 that he bought in 2012 to restore and to fulfill a bucket list wish of driving Route 66 in a vintage road car. "I'm 79 and can't do road trips anymore, so it's time for someone else to use it like it was meant to be used. I've got a few other cars for driving around town," Olsen said standing beside the immaculate burgundy and grey sedan parked just inside the main entrance. Not everything for sale at PIR was automotive related. Bret Bretthauer sold vintage, hand-crank record and cylinder phonographs that he finds and restores as a hobby. The oldest was a 1905 Edison cylinder phonograph that worked perfectly. "I started out selling car parts, but they're too heavy for me to haul out here anymore," Bretthauer said. 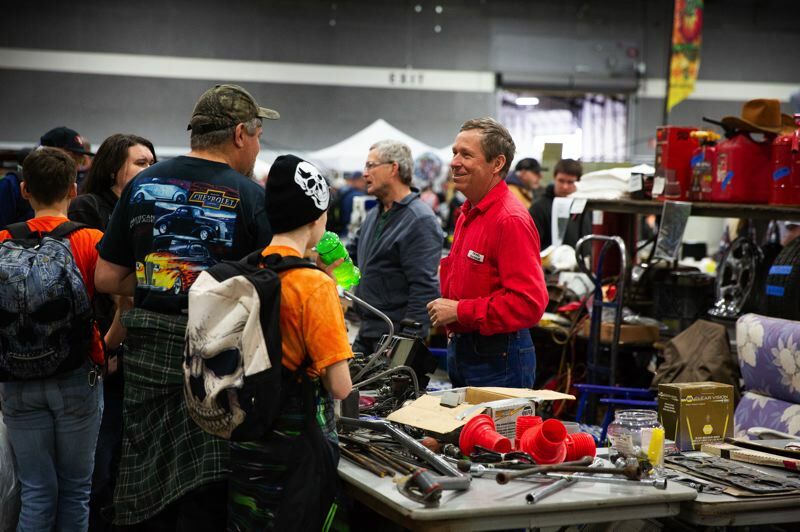 Over at the 55th annual Portland Antique Auto Swap Meet held at the Expo Center, rules require that sellers stick more closely to automobiles and automotive-related parts. Some sellers were inside, where the only sign of rain was the wet clothing of those who roamed the aisles between tables. Mark Tindle did a brisk business in hubcaps, searching among well-organized boxes to find those not on display in his booth. Some restored vehicles also were for sale in the center, including a deep red 1934 Ford that attracted a lot of attention. But so did the chassis of a 1947 to 1955 Chevy pickup that had been cleaned and outfitted with updated suspensions parts and wide tires on chrome wheels. A number of longtime attendees remember the two meets started as one event, but split many years ago for reasons that no one could recall. Although holding them on the same weekend might sound self-defeating, Lamond said that boosts attendance by offering so much for sale, people come from long distances to hit them both. "I've met people from Canada, Australia and New Zealand who plan trips to Portland around them," Lamond said. Perhaps because of that, despite the weather, overflow parking was nearly full during the weekend at Portland Meadows, the former horse racing track across I-5, which was also served by the shuttle buses.